You must be at least 18 years of age with a current photo ID. DO NOT forget your I.D., because you must have it when you check in. There are no exceptions to this rule. Yes. Please contact our staff for further information. There is an additional fee of $2 per lb. if you are over 200 lbs. Reservations are highly encouraged, especially for Saturdays. For those with unpredictable schedules or if you are feeling spontaneous, same day scheduling and walk-ins are welcome. It is recommended that you call prior to coming out and check our availability. If a reservation is what you prefer, then a $25 non-refundable fee (per person) guarantees you our time. Once your reservation(s) is made, the time(s) is automatically marked out as unavailable. In the event you call back and cancel or reschedule, this is when the $25 non-refundable fee(s) will be charged. Otherwise, payment will be collected in full when you arrive for your appointment. It is advised not to make a reservation if you think that something will interfere, because you will be charged $25 (or more) depending on the size of your group. At only $25 per person, this is a courtesy fee making it possible for you to get out of your reservation without having to pay full price for your ticket. My reservation is at 10:00am, when should I arrive? 10:00am is your arrival time. You can be a couple minutes early or a few minutes late, just get to us safely. What do we have to offer our students? Can we bring along our own camera or GoPro? No. Your cell phone, camera and GoPro must stay on the ground. You must have 200 jumps before you can jump with cameras. Can we all go up together? Our aircraft carries up to 14 jumpers, so we like to have as many go together as possible. The smaller your party then most likely you will be on the same flight and for larger groups it will take multiple flights. Our aircraft is the largest in the state of Utah and provides the most comfortable ride to altitude. Depending on the size of your group, you will want to plan for half a day. Dress how you would go out chasing errands, comfortable for the days temperature. We have jumpsuits that go over your clothing. Sneakers are best, no opened toed shoes or sandals. Can my friend and I share the cost of one video? No. The videographer can only capture one person per flight. If you desire to purchase this service, the price would be per person. You get your money back. Only kidding… in the very unlikely event that the main parachute doesn’t open properly, there is a reserve parachute in the top of the container which has been inspected and packed by an FAA certified parachute rigger. All of our reserve parachutes are equipped with the most reliable and modern computerized AADs (Automatic Activation Device) available. About 1 minute of freefall and 5 to 7 minutes under the parachute. If the weather does not permit safe jumping, you will have the option to reschedule or cancel. We don’t know until the day of your jump if we will get weathered out, so if it looks questionable it’s a good idea to call us prior to driving out. Maybe, or perhaps maybe not. It’s natural to be frightened of the unknown. You will definitely feel a surge of excitement and anticipation before the jump….this is a normal part of the experience. During the jump itself, you’ll probably feel a thrill that you’ve never experienced before – enjoy it! Why should I jump with your skydiving center? We have the most professional and experienced instructors. We take pride in maintaining a high-quality level of standards. 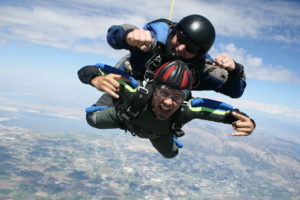 You may decide to only jump once in your life-time, so why not choose the overall best for your skydiving experience? When it comes to pricing, one may ask…Why is this other skydiving center offering such deep discounts? In this business, you get what you pay for. i.e. Folks don’t always go looking for a physician that can provide them with the very best deal. 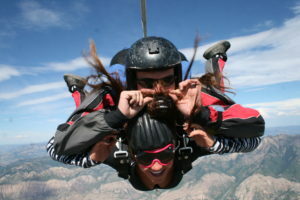 Some skydiving centers have less to offer, so their ‘special’ advertised price should reflect their ‘everyday’ price. There are big differences when it comes to comparing skydiving services, aircraft and facilities. You certainly deserve to know and understand what they are. Buyer beware before pressing the ‘special deal’ button, rather than find yourself disappointed from the misrepresentation of an ad. We recommend you drop by the facility first and be confident when making your purchase. This may save you some grief from an impulse buy, of what you thought otherwise would be a whole different experience. When something online appears too good to be true, most often it is. Our primary aircraft is a Grand Caravan, which provides the safest and most comfortable ride to altitude with 14 scenic windows. The large door makes exiting the aircraft extremely easy. When it comes to jump aircraft, skydiving schools around the world hunger for this type of turbine aircraft, because when it come to maintaining, piloting and safety a Caravan is the way-to-go. The view and flight to altitude is unsurpassed. Others may say their scenery is awesome, but please…let’s be honest here. Flying over Waterfall Canyon, Ben Lomond Peak, Snowbasin Resort and basking in the infinite view of the Great Salt Lake there really is no comparison. Seeing beautiful scenery from a distance is one thing, but to bask in the beauty from right over-top is most definitely another. We know that you will experience an enjoyable ride to altitude, which is a large part of your adventure. We train world champion skydivers and continue to make our mark on the industry. The winds in Ogden are historically more favorable. For the jumper in training, waiting for the winds to be within your range is a large part of the training process. For the experienced jumper, we are located only 5 minutes from the wind tunnel. Our facility is conveniently located to many other amenities.